Here's what's been happening in season four of Arrow. Felicity returns home, confined to her wheelchair, and tries to maneuver through her new life. But it's not so simple. The moment she's left alone, she begins to hallucinate herself. Well, the college-age, hacker version of herself. And this version has nothing sunny or optimistic to say. While Felicity keeps her internal struggle of self-doubt to herself, Diggle and Lyla deal with an external struggle: ARGUS. A former associate of Lyla's interrupts their date in order to get a message to Amanda Waller. But before he can relay the message, an armed van attacks and kidnaps him. Later, his body is found--dead, dumped, and missing an eye. After meeting with Waller, Lyla learns of a shady group called Shadowspire. Fortunately (or unfortunately), Diggle's brother Andy used to be part of Shadowspire. Thus, Diggle gets information about the group from Andy. Team Arrow heads out using Andy's Intel to find the group. But Felicity, still hallucinating, accidentally sets off an alarm that almost messes up the entire mission and puts the team in harm's way. They find two more dead ARGUS agents, and Diggle learns his military commander is in town with the Shadowspire group. Andy gives more tips on what Shadowspire is up to, but Diggle hardly listens. Thus, when Team Arrow goes to interrupt what they think is a weapons shipment, they find nothing. Instead, Shadowspire infiltrates ARGUS. Diggle and Andy are in a back room cell at ARGUS, watching from a video feed. Shadowspire threatens Lyla and Waller to give up codes or they'll start shooting people. But Waller won't crack, no matter what. So they kill her. (Bye, Amanda Waller. You were great. Thanks, Suicide Squad for stealing all the character rights*.) Diggle goes to intervene, leaving Andy in the cell (despite his pleas that he can help). But Shadowspire finds Andy before Diggle makes his move. He, unfortunately (or fortunately), alerts Shadowspire of Diggle's plan. 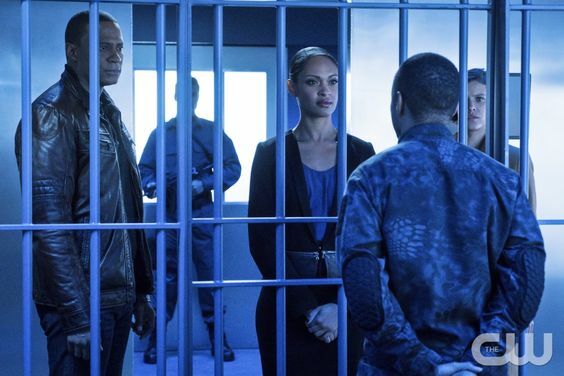 With Diggle captured, Lyla has no choice but to hand over the codes. Except... she can't: someone is blocking her. Someone from outside. Felicity. Things seem to be looking up for Team Arrow. Diggle and his brother are working out their differences. Felicity is finding her confidence. (And her own code name: Overwatch. Because, as Oliver states, "Oracle" was already taken**.) However, it is revealed that the true boss behind Shadowspire is the commander from Lian Yu (the island for those of you who don't know the name like me), who, you know, had Oliver locked up and tortured. *Most of the characters related to the Suicide Squad have been eliminated from the show in the past year (Deadshot, Waller, even a Harley Quinn cameo ended up on the cutting room floor). While it's not confirmed, it most likely has to do with the Suicide Squad movie and the rights to characters from the comic books associated. It's a shame DC can't do something crazy like connect their TV show to their movies... huh. The team is chasing down a thief when Thea collapses. It's a side effect of the Pit, of course. She hasn't needed to sate her blood lust in a while (Thanks, Damien Darhk), and now it's affecting her. 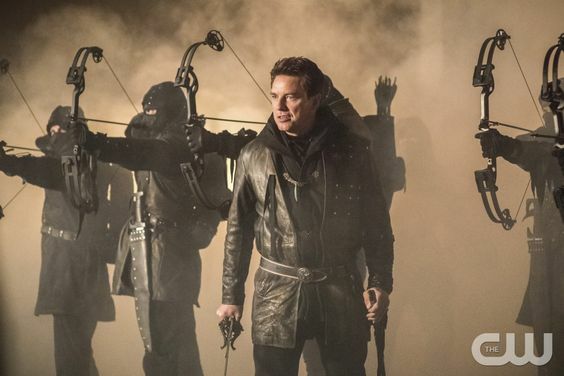 Malcolm Merlyn conveniently arrives to convince Oliver to let her kill so she's not the one killed. Oliver, whose super power is guilt and blaming himself, doesn't know what to do. So he goes out on the streets to catch their thief... only to find out it's Roy. Yes, that Roy. Roy escapes because of Oliver's shock. Team Arrow tries to figure out what Roy is doing in Star City and why he's stealing stuff. Felicity figures out all the items he's stealing could be put together to create a web bomb. Aka.. it would destroy the Internet! The only issue is it would need a pretty sustainable power source... which happens to be the current project of Palmer Tech. (Uh-oh.) 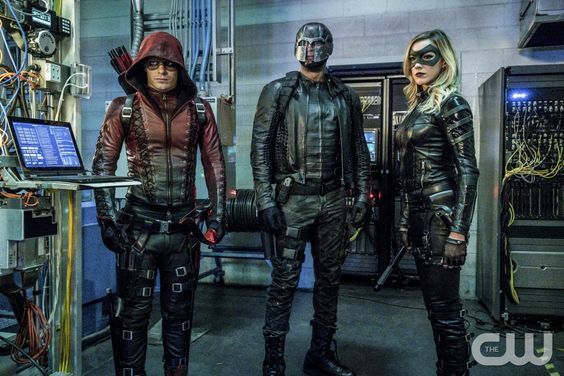 Thus, Team Arrow is able to ambush Roy when he breaks into Curtis' lab. Roy grabs the powerful power cell and tosses it out the window toward a drone. Then, Oliver shoots him in the chest... with a tranq arrow. They make it look like Roy is dead... again. He had a fancy piece of tech in his eye, which would tell whoever he's working for that Roy was captured. So while Roy recovers and explains why he's back, Felicity examines the tech. Roy is being blackmailed. If he doesn't help steal pieces and parts, someone will expose who he is... that he's not dead, that he's not the Arrow, etc. This man goes by... the Calculator. (duh-duh-DUN!) He has what he needs to destroy the Internet, so Felicity tracks him down to chat. Then, they battle. The Calculator, however, has planted a real bomb to explode in Star City. Team Arrow swoops in to stop it. Oliver swoops in to save them. And Roy offers to stay behind in order to manually shoot the bomb to stop it from activating. However, the entire Team Arrow gets out safely to save the day. On the Island, Oliver is being tortured and hallucinates Shado. (People in this show love to have visions because of their injuries, don't they?) She tells him to admit his feeling to Taiana, then she hands him an engraved rock. When Oliver wakes up, he tells Taiana the truth about her brother. Let's just say, she's not happy with him. Arrow Episode 13: "Sins of the Father"
Oliver tells the team about Nyssa's offer to kill Merlyn in exchange for Thea's cure. They think he should do it; Merlyn is a terrible person and has done terrible things to them over the past three years. Yet, Oliver hesitates, thinking of Thea. He doesn't want her to lose her father, no matter the man he is. The loss of his own father propels him to think of another solution, one in which Merlyn doesn't die. He tries to get Merlyn to give the ring of Ra's Al Guld to Nyssa in exchange for a cure. But neither trusts each other. And when two powerful assassins don't trust each other, this spells trouble for the heroes trying to keep Star City safe. On the Island, the fancy carved rock happens to be the last item the soldiers need to find whatever they're looking for. In Taiana's rage toward Oliver, she hands it over to the soldiers. But they tie her fate to Oliver's, telling her she must take care of Oliver or else she'll die too. *So what if the "he" in the end scene of doom isn't Damien Darhk? What if Oliver is referring to Merlyn? Could he do something so terrible to make Oliver go after him once and for all? I mean, this is what the show is building toward, right? Oliver has to kill Merlyn in the end. There's no other option. What do you think of the most recent episodes of Arrow?